Happy Tuesday Lovelies! It’s been hot here in Melbourne so I have spent my days relaxing at home with my air conditioning blasting! Tried to stay busy but it became very difficult when my stupid power decided that it was overworked and underpaid and went on strike! We waited for a little bit but darted out of the house to a family members home that was not only powered but their air conditioner was better than ours…..so that was a bonus! Luckily the heat wave has given us a break for a few days before it decides to hit us again. 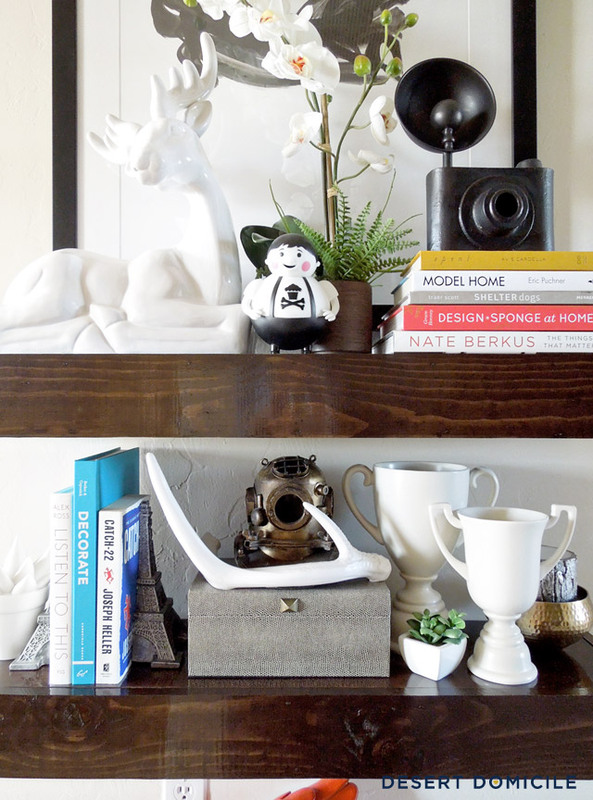 Sorry rambling……a friend asked me recently about styling shelves and how to use them for their intended purpose while still keeping them pretty and uncluttered. Sounds difficult right! The bookshelves in my home tend to become a form or storage where anything that doesn't currently have its own place ends up. I see them every day, screw up my nose and decide it’s a job for another day. That day is still yet to arrive! However I thought I would share some hints and tips about styling your shelves, using them for their purpose and keeping them pretty at the same time. Firstly when tackling your shelving situation it’s always a good to start with a blank canvas…….get everything off the shelves! I bet you forgot how big your shelves were! At this stage in the process it’s always a good idea to work out what you really need to keep and what you haven’t touched in years that should be either donated or thrown in the rubbish. De-cluttering at its finest! 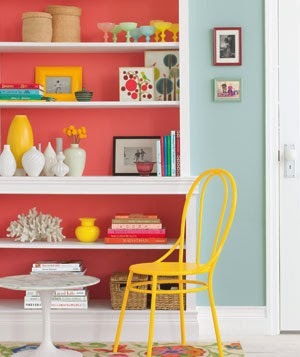 Now that you have your blank canvas there are a number of things you can do, you can jump right in and start putting the items you kept back in, or you can decorate it a little bit first. 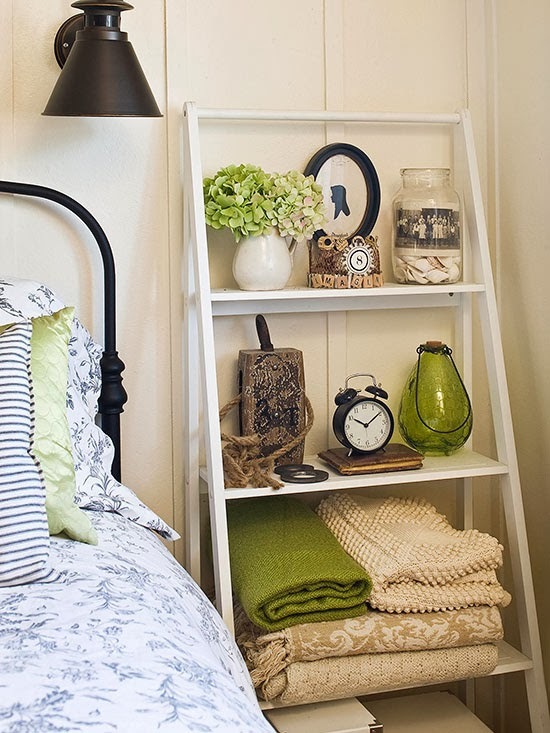 I absolutely love the look of a shelving unit which some wallpaper or paint that jazzes up the back of the unit, it adds that little bit of extra flare and just makes it look pretty! 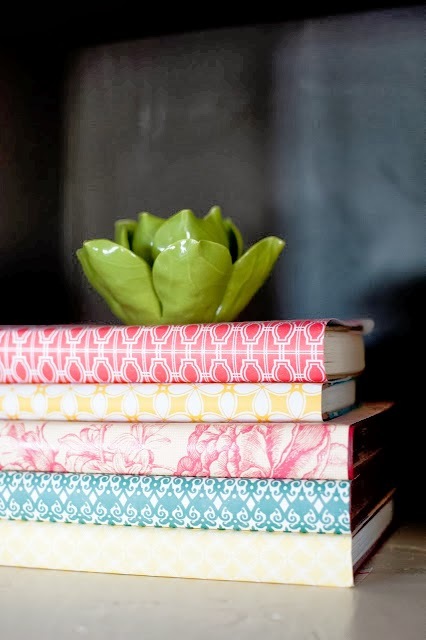 You can even create some accents out of your books by covering them with fancy paper as well. I have a few books covered in fabric that I style with that look absolutely fantastic! A simple little DIY project makes the world of different. I might even share how I covered my books with you in an upcoming post. Simple but looks amazing in the end. Now that your bookshelves are ready to go you can begin the fun part……styling! Now obviously one of the first things you should put back are your books……there you go, bookshelf being used for its intended purpose. 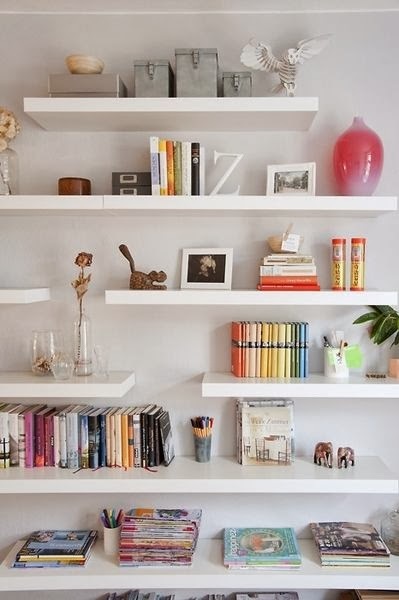 I find that books all stacked vertically are boring to look at, so because we want to make our shelves look pretty try stacking your books both vertically and horizontally. 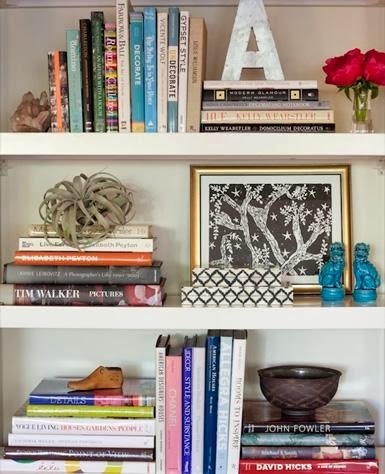 When you place some of your books horizontally they almost create another ledge to work with, place a small décor piece, it doesn’t matter what it is, on top of your stack of books. Placing objects vertically gives more height to your shelves, creates the illusion of more space and makes the unit look taller. It also helps draw your eye up to the top of your object which helps bounce your eye between different items. You don’t want someone to look at your fantastically styled shelves and focus on one point, all of your hard work will just go to waste. Another thing I love to do when styling my books, is I love to keep them in colour groups and sometimes create a bit of a rainbow effect. Once all of your books are back on show you can then start to mix in alternate items, place a group of smaller objects next to the books, preferably in off numbers, groups of 3 or groups of 5. 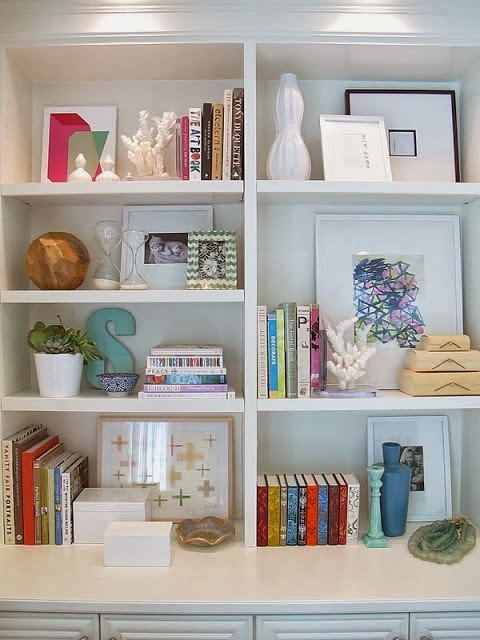 Don’t be afraid to layer as well, try adding some pictures in frames or prints at the back of the shelves and layer with a few smaller pieces in front of the frame. 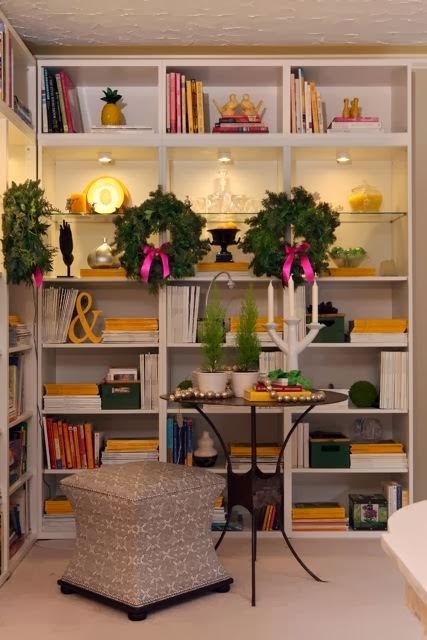 Make sure not to cover the whole picture and not just to place items in the centre of the shelves, that begins to look a little pedestrian and you will notice that people are not as interested in what you have on display. Make sure to use objects that are all different heights to keep the eye moving. When you are doing this however remember that bigger accessories stand out more and have a bigger impact than smaller ones. They also take up more space which is helpful if you don’t have a lot of things to decorate with, or if you aren’t too keen on dusting your shelves every day! 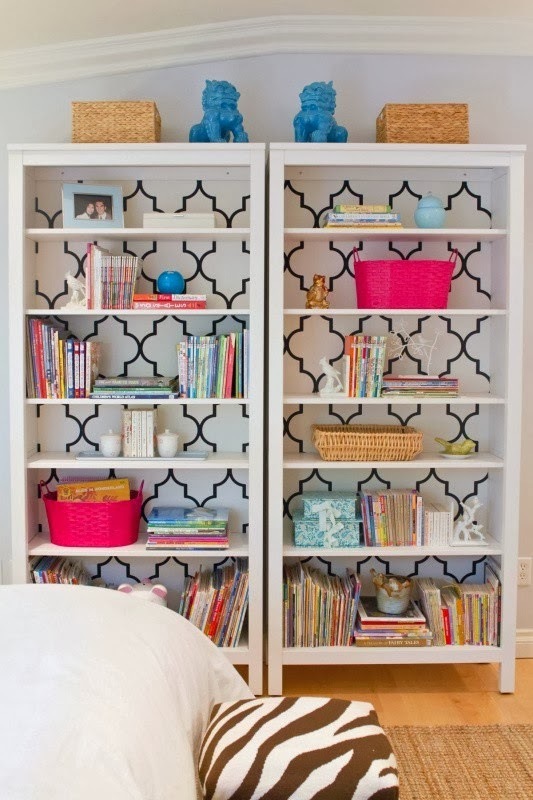 A few more tips for you to keep you thinking when styling your shelving. A bit of greenery freshens up the look of anything and everything around it, even if it’s fake, so throw in some greenery. Make sure that you have lots of colour. 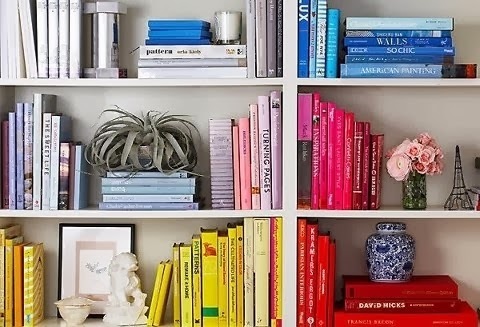 The eye moves when there are many different varying objects, but the eye also is attracted to colour so make sure you include several splashes throughout your shelving. Also make sure not to over clutter your shelves, you have just de-cluttered so let’s not get carried away when styling, keep it simple and minimal. Once you’re at the end of your styling make sure you step back and assess the final product. Sometimes I find that there is just something a little bit off, it could be an item in the wrong place, the colours of my book spines not working together or even too much negative space. Taking photos of your work is always a great way to work out what needs to be changed etc. Make sure you take a photo each time you move something around, that way you can look back at your catalogue of photos and see which one looked best. Sometimes it is also a good idea to walk away for a little while, maybe go and cook dinner, read a book or simply just have a styling break for half an hour and then come back with fresh eyes. You may see something that you missed before and all of a sudden….perfection! I love seeing other peoples styled shelves so please share! It might even motivate me to tackle my own.